Welcome to our worldwide travel agent page! Want to promote our region? New Marketing Material to download at the end of this page. Why not also join the 50 Degrees North Agent Facebook group. All of our products are available to travel agents worldwide and we welcome bookings from our industry partners. We are also an official Hurtigruten Sales Representative and Agent worldwide and sell all Hurtigruten products. Please call one of our offices in Norway, Canada or Australia to speak to our Scandinavian staff for any agent queries and bookings. 50 Degrees North is independently owned and operated from offices in Lillehammer, Norway; Vancouver, Canada and; Melbourne, Australia. We are a fully registered company in each Norway and Australia and follow all industry regulations set forth by local governments. Our vision is to be top-of-mind for operating innovative, authentic and responsible travel experiences above the 50th parallel north. 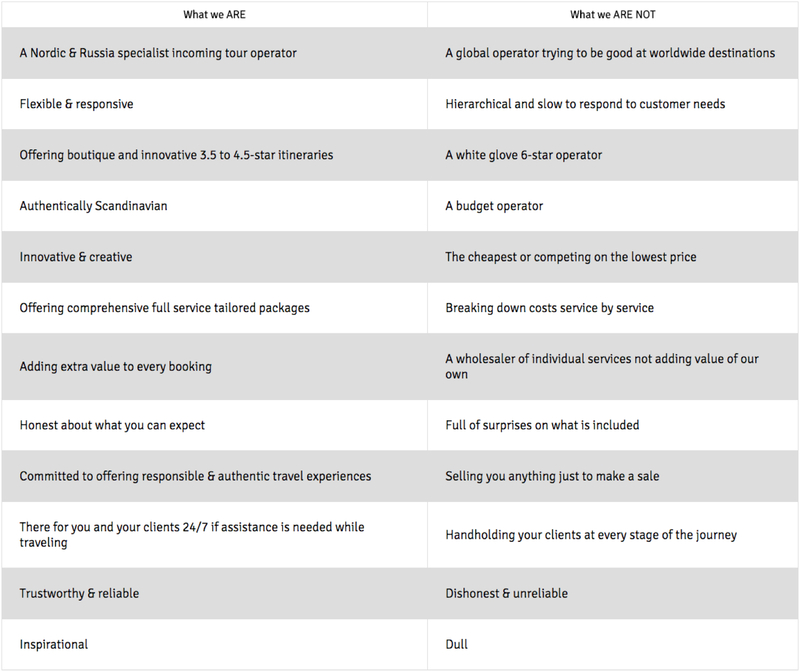 Please read this table to find out about whether working with 50 Degrees North suits you and your clients. We are a Virtuoso Tour Operator, not a Virtuoso 'On-Site'. 50 Degrees North Pty Ltd is full participant of the AFTA Travel Accreditation Scheme (ATAS) with ATAS Accreditation number; A10454. We are a Virtuoso preferred supplier and CATO Registered Operator TO1112. Meet our Groups Department team members here. We understand that every group is different and can customise packages to suit your interests and requirements according to the travel purpose. Our itineraries are competitively priced, given our strong relationship with our local suppliers and preferred rates with airlines, hotels and transport suppliers. Read further about our Scandinavian Group Travel here. Furthermore, our 24-hour, 7 day a week emergency support service offered by our Norwegian office provides peace of mind and timely assistance for all our travellers. 50 Degrees North provides personalised service and will go the extra mile to ensure the seamless delivery and coordination of your journey. How do we book a 50 Degrees North package? How much deposit do you need and when is full payment due? Do you offer wholesale airfares? Are flights included on your trips? When do I get my documents? My clients are not interested in a 'tour', can you custom make an itinerary? Do you book hotels only? I appreciate that you need a booking form completed, but will you contact my client directly? Where can I find your booking form and terms & conditions? Do you have sales reps that can come and see me? Can I read some Travel Agent feedback and reviews? You can email us on info@fiftydegreesnorth.com or simply give us a call on (Australia) 1300 422 821 or (Norway) +47 21 04 01 00. Or you can click the 'Book tour' on any of the tour pages on our website and complete the booking form. We will then get straight to work confirming your booking. Australia: by eNett or bank transfer only. Bank details are listed on our invoices, which you receive when payment is required. Typically, a deposit of 20% is required unless it’s in very busy times (Christmas bookings) or voyages to the Arctic region where a deposit of 25-30% is required. Full payment is due no later than 70 days before departure, 90 days if you have a Arctic Expedition Voyage in the trip. Yes we do, contact us for more details. We offer wholesale airfares ex. Australia only with Emirates, Qatar and Finnair. And, if you need help with flight options between small towns in our region, feel free to call for advice. Yes, sometimes. We try to make this as clear as possible under the 'Trip Details' tab online and inclusions header in our brochure. However, if you are unsure please check with us. We issue documents 30 days before the date of first service. If you need them earlier than that, please give us as much notice a possible and we’ll do our best to accommodate your request. No problem, all our staff are of Scandinavian background with many years of experience in the industry. A great network of partners in our region means that there are very few things we can’t do. 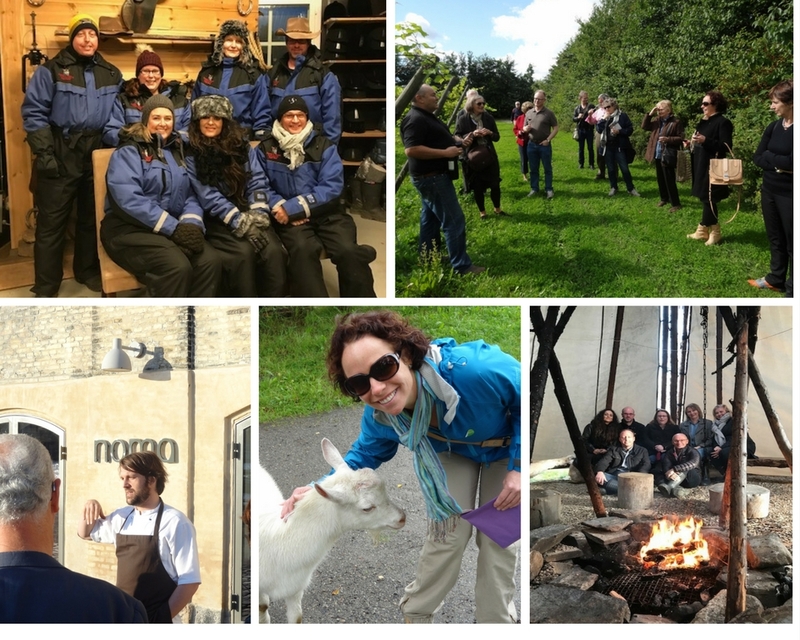 Over the years, we have organised weddings, skiing trips and food tours, just to name a few of the ‘out of the ordinary trips’ we’ve organised. Generally, no as we are a tour operator rather than a wholesaler of individual services. In most cases we are contractually unable to itemise hotel rates, as hoteliers give us competitive package rates on the proviso that they are always sold in conjunction with a package only. So, when it comes to hotel only bookings, you are better off using an OTAs or an accommodation wholesaler. No. They are your relationships and we are grateful for the hard work you put in. In an emergency situation out of business hours, we may have to contact your client directly (such as last minute boat cancellations etc. ), but you will always be kept in the loop. In the greyish black navigation bar at bottom, under ‘Booking’. No need to print the booking form, just complete and submit and this generates straight to our reservations team. We most definitely do. Please contact us if you’d like a visit. Of course - and check out our extensive and insightful Testimonial Page as well. "Thank you for assisting me with recent bookings to Scandinavia. Your knowledge has been a terrific learning skill for myself in a region I am not that familiar with. Also your patience with clients who change their minds has been a wonderful thing. I have no hesitation in recommending you and your company to individual travellers and also travel agents alike. Again thank you for everything." "This is a very belated note to thank you for your advice and the arrangements you booked for my travel within Scandinavia in August/September last year. The accommodation you booked for us was all of an excellent standard in their respective classes and always well located. Your advice about using self-drive to get between Trondheim and Bergen and the use of car ferry services and Express Boat etc was spot on and we are very grateful for the contribution you made to an excellent holiday. Given my experience, I have no hesitation in recommending Fifty Degrees North to colleagues, friends and family." 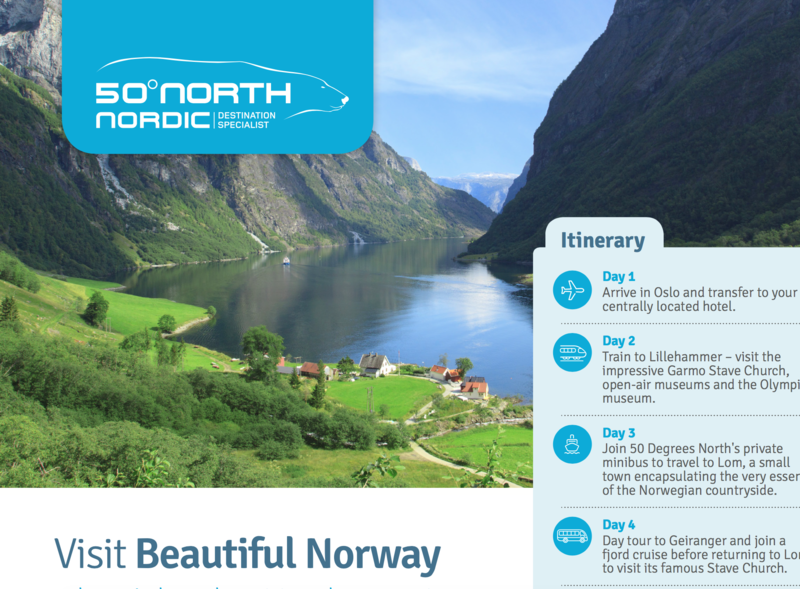 "Fifty Degrees North, a travel company based in Melbourne with an office in Norway, acted on behalf of WEA in making all local arrangements in the four countries visited. From my first contact with the owner and manager, Tietse Stelma, in designing the tour, all requests for information were answered promptly and efficiently. In all my subsequent dealings, I found the staff very professional. Having a base in Scandinavia in a similar time zone to our travel where contact could be easily made and assistance given was extremely helpful in the case of missing luggage for one of our group. It was a great reassurance to have Satu’s assistance and without it the luggage is unlikely to have been located so soon. Similarly, it was reassuring that Alice in Melbourne was keeping oversight from afar. I strongly recommend Fifty Degrees North for future tours to these parts." You can download some of our most recent flyers below. If you would like any custom made material, facebook tiles, images or flyers, with your logo, please contact us.